"I'm just curious if I'm up to the challenge." He is planning to check in with his doctor during the fast. WISH-TV reported that Jones did not have a license for the Hi-Point 9 mm weapon. "I was screaming," she said. "I saw his tongue moving. ... The man of God completed the miracle by praying because prayer is the key." The students used music stands as makeshift easels, where they painted "happy little trees" and projected an episode of "The Joy of Painting" as parents memorialized the special day with photos and videos. "I love my parents, and we have a great relationship, but they had me for their joy and their pleasure," Samuel explained to The Print. In Nhat's case, upon arrival at the hospital, his blood methanol level was 1,119 times higher than the appropriate limit. Niessen explained to Time magazine that the recipient wipes their nose with the provided tissue and contracts a cold virus to get it out of the way before, say, leaving on a vacation. In a subsequent phone call, the victim told his aunt: "Titi, man they got this alligator on me and they saying that if no money is given they are gonna have him chewing on me." "You kind of laugh about it afterwards because technically he didn't do anything," Dungan said, though police later charged him with petty theft and prowling. However, there is a name on the bear's tag, and Desai is hoping to find the owner through that. 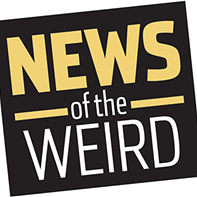 This week, we're revisiting some of the weirdest of the weird news we enjoyed in 2018. Happy Weird New Year! The Tampa Bay Times reported officers stopped the truck and questioned Concetta Didiano, 22, and her mother, Cassanra Kerr, 40, who said they had driven the 200 miles from their home in Tampa so Didiano could learn how to drive the truck. Large has worked as a Jack Sparrow (of the Pirates of the Caribbean movies) impersonator, and she believes her job opened the door for her spirit-husband to reach out to her. "I believe the shape of happiness and love is different for each person,"